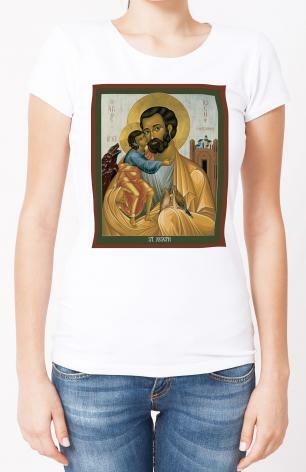 This icon depicts St. Joseph with the Christ Child, when Christ was presented in the Temple. By Jewish law, a mother had to bring an offering to the Temple and be purified 40 days after giving birth. The normal offering was a sheep, but a poor family, like Christ’s, could bring a pair of doves instead. Behind Christ is the cave where he was born in Bethlehem. Above Joseph’s other shoulder is the city of Jerusalem, with its Temple. While the doves are to be offered on this day, at the end of Christ’s life, he himself will be the sacrificial victim in Jerusalem.